A Glimpse of Turkey: A photographic essay on Turkey by Peter Riggs. Includes history, cultural details, and commentary. Ed Tanzer's Summer 2002 Photo Gallery: Includes pictures from the eastern and southeastern regions. Focus Turkey Tourist Map: Detailed tourist map of the country comprising several pages. Map of Turkey: Including map, statistics, and brief overview of history. 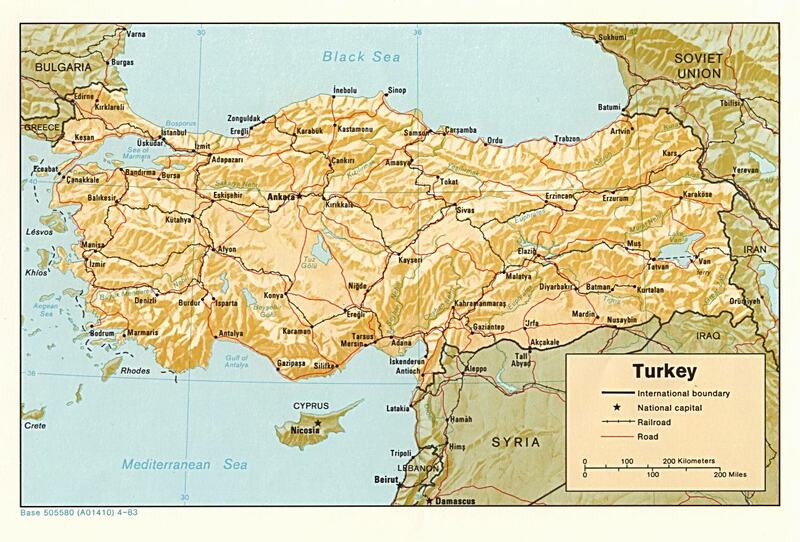 Map of Turkey: Shaded Relief, 1983. Photograph Album of Kev and Shirl's Trip: A 3 week journey through some parts of the country. Contains images and text for each image. Regions of Turkey: This site includes numerous photos taken by Billy during his travels throughout Turkey. Road Map of Turkey: You will find plenty of information where to go and their maps. Turkey Photo Gallery: Turkey daily-life impressions by Dutch travel photographer Hans Hendriksen. Turkey in Pictures: A selection of pictures exhibiting unique cultural sides of Turkey with short descriptions.